The P7000 Series presents unmatched durability and superior print quality resulting from patented technologies and a choice of speeds to handle your company's individual printing requirements and challenges. This makes the P7000 an economical replacement for Printronix P5000 printers. All models are ENERGY STAR qualified. The High Definition P7000 models offer a proven plug & print alternative for expensive and unreliable laser printers. Together, these innovations present a compelling reason to upgrade your printing solution to the Printronix P7000 series. Leasing Available from $20.18 per month! Printronix line matrix printers set the standard in the industry. The P7000line matrix platform features the lowest service cost, least expensive cost perprinted page, easiest user experience and longest-lasting ribbon available. By design, this framework has produced the best line matrix printer in Printronix history. The P7000 platform is even more reliable, and is future-proof. Because of its scalability, the P7000 could be the longest-lasting printer any organization will ever own. Designed to meet your printing demands today and adapt to match your future printing requirements. Your investment will be protected with Printronix upgrades to support emerging standards and innovations. Printronix invented line matrix printing and maintains a reputation as a technology leader in the printing industry, with innovative solutions to real-world challenges. The P7000 offers unsurpassed reliability. When your application cannot be interrupted, look to the P7000 for maximum productivity. For cost control, this technology provides the edge needed, giving you the lowest cost per page output. It handles specialized forms that work for your application forms that can only be printed on a line matrix printer information reports, multi-part transaction documents and bar code labels. visibility and control without any user set-up. This allows the system administrator to have precise control over print quality, consumable costs, and job planning. Add in PrintNet Enterprise and the visibility and control, along with instant e-mail alerts, comes right to your desktop - ideal for enterprise management of printing applications. The pedestal model has been completely redesigned for the P7000 Series. The enclosed cabinet models provide for near silent operation, making these printers perfectly suitable for use in the quietest of office environments. In addition, these models provide the best paper handling for large print runs. All input paper is sealed inside and protected from bumping and contamination. Even more importantly, an elegantly simple, but highly effective combination of moveable fences and chains allows for neat stacking all the way up to a full box of paper. For tougher forms that tend not to refold well, a SureStak power stacker option is available for the enclosed cabinet models. With this option, even the toughest forms can be printed and stacked neatly up to a full box. So, in either configuration, the enclosed cabinet models are your best choice for large unattended production printing applications. In creating the next generation of line printers, customer feedback was used to identify enhancements that would simplify operation, enhance the user experience and boost productivity. Today's IT environment is changing faster than ever and it is impossible to tell what is going to be required of your IT assets in the future. This is why anew PSA 3 controller with expanded memory and capabilities was developed especially for the P7000. Just as the P5000 was able to grow with a changing IT environment for nine fast-paced years, the P7000's new PSA3 controller provides all the base foundation and necessary room to grow with the next generation of changes. So, whether your needs evolve to new data streams or expanded wireless options, your investment will be protected with the P7000. The P7000 provides the most connectivity and emulation options available on any impact printer. Mix and match between wired Ethernet, wireless Ethernet, parallel, serial, Coax and Twinax. Couple this flexibility with automatic port switching and you can easily connect your new line matrix printer to multiple systems. Often this is an ideal solution for environments migrating between hosts. Available emulations include P-Series, PGL, VGL (Code-V), DEC LG, PCL 2, ANSI, IPDS, and the most common serial matrix languages. What is most important about all of these emulations and connectivity options is seamless compatibility. By design and through rigorous testing, the P7000 is able to seamlessly replace any previous Printronix line matrix printer and virtually any competing legacy impact product. Understanding that often a simple modification to the application is just not possible, all P7000 printers come standard with the ability to intercept and modify a data stream before printing. Any changes can be corrected or modified to create the desired output without any costly host application modification. There is a large installed base of coax and twinax connected line printers. Traditionally, migrating away from Twinax or coax to Ethernet eliminated the costly and inflexible infrastructure, but also eliminated the valuable job control. Now, with TN3270, TN5250, or the latest IPDS, the choice between cost/flexibility and control is eliminated. Using these new options, you can migrate to Ethernet printing and still maintain all the job control these mission critical applications require. Complete compatibility Designed for upward compatibility to support and manage the entire Printronix family of future printers in a fast expanding network. These printers are fully compatible with existing Printronix line matrix, thermal bar code and fanfold printing solutions that frequently operate in the same enterprise network. The P7000ZT Series incorporates the industry leading features of the P7000pedestal model printers clamshell design, Ultra Capacity consumables and Integrated Print Management. Unique to the P7000ZT Series is the special push tractor configuration. This system enables you to print from the very first to the very last line of a form and then tear it off with no loss of forms. This series is ideal for applications requiring precise accounting of all forms or where forms are simply too expensive to waste. Especially, when each form is torn off and used individually, the elimination of waste between sheets can yield significant savings. The smart paper system automatically ejects the paper for tear off after the page or job is printed, and then retracts it as soon as the next job is sent. Or, at any time, you can use the Eject key to present or return forms as necessary for tear off. 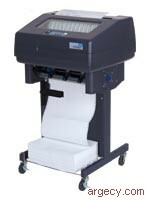 Often, lighter duty dot matrix printers are used for applications requiring zero form loss impact printing. However, as print volume and mission criticality increases, the economic viability of these printers rapidly diminishes. In contrast, the P7000ZT Series, using the Ultra Capacity ribbon, typically delivers a 10X consumable cost advantage over dot matrix. More importantly, the robustness of P7000ZT sixth generation line matrix technology helps avoid the highest cost of all in mission critical printing lost production due to downtime. This combination of high reliability and low operating cost makes these printers the ideal solution for demanding production applications. The cost savings, reliability and forms flexibility offered by Printronix line matrix printers continue to make this the best technology option for many critical print applications. The P7000HD Series extends the reach of applications that can benefit from this technology even further. As existing line matrix applications are migrated to new systems or new applications are developed, the traditional method of hard coding applications for a specific printer is diminishing. Instead, programmers are leveraging more general purpose Windows based tools that take advantage of a virtually limitless array of font styles, sizes and graphics, while avoiding any printer specific coding. The P7000HDprovides all the necessary print resolution and system capability to drop straight into these typical laser environments without any application modifications or special accommodations. These printers offer such high definition that items such as proportional spacing, complex fonts, logos, IPDS and super small point sizes look just as they are designed and intended at a fraction of the cost of laser. Using theP7000HD high performance Windows drivers, the application programmer designs the output to match their requirements without needing to worry about any limitations of the printer. The nominal print density for these printers is 180x180 dots per inch (DPI). Alternately, 120x120 and 90x180 DPI modes are available when image detail cane traded for speed. The printers incorporate special fine tip technology to produce much smaller dots than the standard P7000. All of this is driven by theP7000's PSA3 controller, which provides the necessary power to drive these complex graphics at full speed. The result is the sharpest highest quality image ever produced by Printronix. A special High Definition formulation of Ultra Capacity ribbon was developed for the P7000HD Series to handle the unique challenges of high detail fine point printing. Like the standard Ultra Capacity ribbon, this new formulation delivers a sharper, darker image for a greatly extended life. The result is reduced user intervention, improved print quality and the best cost per page. And, like all P7000 ribbons, they are fully supported by the Integrated Print Management system. 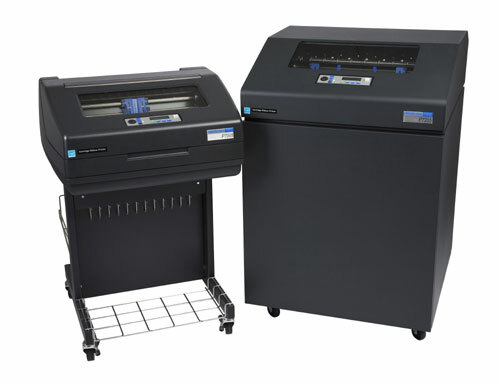 A wide variety of paper handling options are available for the P7000 to help maximize performance in all applications. Front Tray For applications that demand mobility, a front paper shelf allows the source paper to move with the printer. Also, raising the paper off the floor helps protect the media from damage. This shelf is strong enough and low enough to support a full box of paper. Low Rear Tray This output tray is ideal for large print runs. An adjustable back bar keeps the paper aligned and neat even when stacking large quantities. High Rear Tray This tray is ideal for applications where the printer is placed up against a wall and output stacks are limited to short runs. Since the tray is located near the top of the printer, access from the front is easy. Front Paper Access This innovative option allows you to load paper and retrieve output from the front of the printer. This dramatically reduces the space required by the printer, since the rear can now be pushed into a corner or up against the wall (a minimum clearance of 4" must remain for the top cover to open). The adjustable front shelf allows you to select the correct balance between size of source stack and size of stack that can be retrieved from the rear. SureStak Power Stacker Some forms that do to not refold well or tend to fluff up during printing may not stack properly with the passive stacking aids found in the standard quiet cabinet models. For these applications, a SureStak power stacker option is available. This device actually pulls the printed paper over the top of the print path and pushes it down into the stacking area. There, a series of paddle wheels actually refold the forms tightly, so even the toughest forms can be printed and stacked neatly up to a full box. Quiet cabinet models cannot be quiet if forms are too large to allow the doors to shut. To solve this problem, the P7000 can be equipped with optional extended doors. Kits are available with one or two extended doors to fit your application. A single extended door will support forms up to14" in length. Two doors will allow up to 17" long forms to fit inside with all door closed.